Mary Syer is the designer of this quilt on the longarm quilting machine. Summer is supposed to be a time to be with family and friends, relax and take the time to reflect on what we enjoyed during the past year, the friends we visited, new people we met and down the line start making plans for the next season we come together at Robson Ranch. For some the time is very relaxing, and others find that there have been health concerns and time away has been a challenge. I am writing this article from the Pacific NW. We are in the middle of a drought, and there are several fires in Washington State that are impacting many lives. Some lost their beautiful homes in the Wenatchee fire, and other families feel blessed to have safely outrun the flames. Several gals from our club have been recuperating from surgeries and injuries this summer and are looking forward to returning this fall in top-notch condition. Whatever the circumstances, our minds and hearts are never far from Arizona. This summer the year-round residents have been keeping things humming in the quilting room creating personal projects as well as our newly adopted quilt challenge, which will provide charity and comfort quilts for residents of Robson Ranch. It’s always fun to put a little competition into the process of creating new things. Members are also looking forward to the craft show in November, so our time is filling up quickly with busy hands and generous hearts. 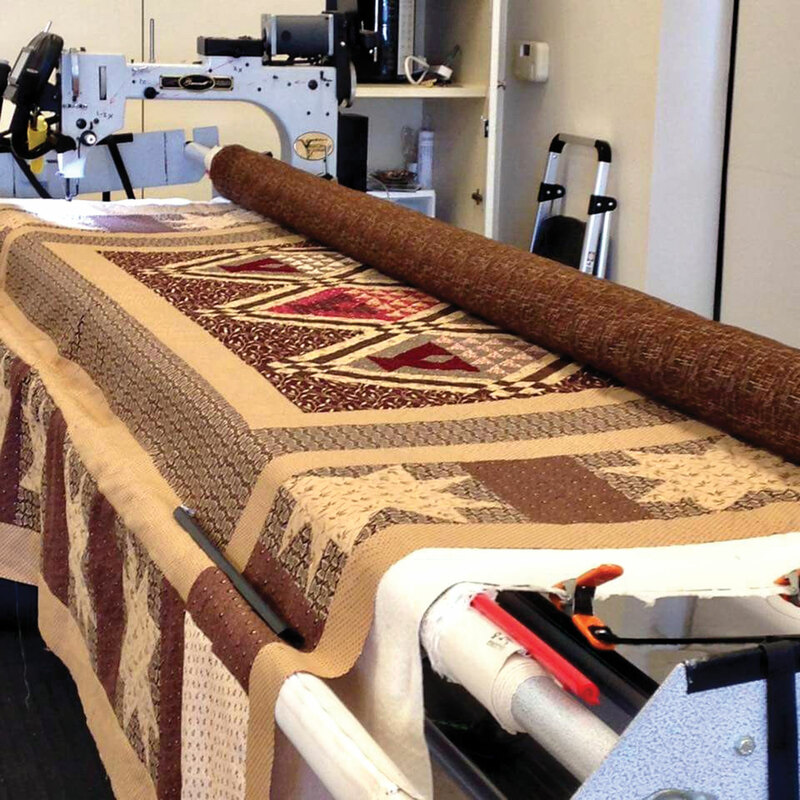 The longarm quilting machine, a gift from Mr. Ed Robson, has been greatly appreciated as members are able to finish the charity and comfort quilts as well as the members’ own quilts they design for family and friends. Many beautiful quilts have been produced and several are usually on display in the glass cabinets in the Creative Arts Center. The opportunity to have a longarm at Robson Ranch is a very special addition to our club! Lessons are available to become certified to use the machine, and a call to Mary Syer or Bea Pressler will put members’ names on the schedule to learn and practice beginning and new techniques. In the quilt center closets are cleaned, lessons for the 2015-2016 season are being planned and comfort quilts have been given during June and July. With the monsoon season here, our quilt room is a perfect oasis for members of our club. The room is available for our club members on Monday, Wednesday, Friday and Saturday of most weeks. If you would like to take a tour, please stop by the Creative Arts Center on any of those days. Any member there would love to show you around!